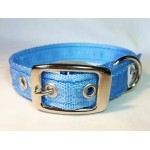 Regular flat collar with buckle and eyelets. Adjustable by 5" .. 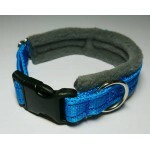 Camouflage polar fleece lined Vari-Fit collar. 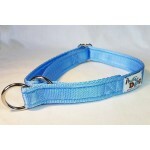 Limited availability SIZING: Small (20mm wi.. 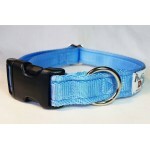 Designed as a safe house collar which will release the dog should they catch their collar on door..
Adjustable collar with no clips or buckles, slip over the head then fit while on the dog. 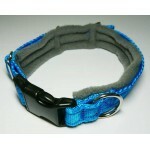 ..
Adjustable collar with no clips or buckles, collar tightens by 3" when main ring is pulled which .. 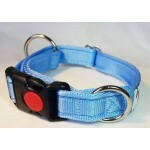 The LoadSafe collar is a side release collar with a special design! 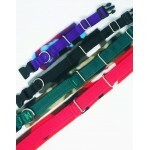 The side release buckle feeds..
Adjustable collar with a strong nylon side release clip. 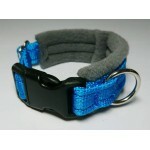 ..
Adjustable collar with no clips or buckles, collar tightens by 2" when main ring is pulled which ..
A custom fit version of our Vari-Fit adjustable padded collar. 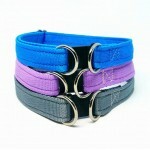 These collars are made to measure ..
Padded adjustable collar, available in 7 colours. 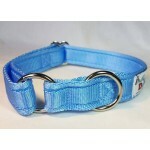 Size small (20mm) - 9-12" These items are held ..
Padded adjustable collar, available in 7 colours. 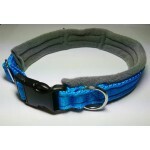 Size medium (20mm) - 12-16" These items are hel..
Padded adjustable collar, available in 7 colours. 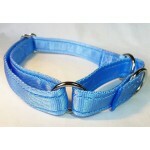 Size large (25mm) - 16-22" These items are held..
Padded adjustable collar, available in 7 colours. 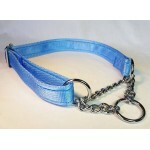 Size X-large (25mm) - 22-30" These items are he..